Bucket lists, vision boards, and life goals. How do you turn dreams into reality? I use an accountability group and have been part of one for over 15 years. The current group is SEA Circle™. SEA stands for support, encouragement, and accountability. In the Germany and Missouri groups, we met face-to-face, but now we connect virtually since members live across the US and as far-flung as Australia. We “meet” every two weeks using a Google document where we post goals and steps we’ve taken to accomplish them. The members can comment, add suggestions, or celebrate accomplishments. It’s up to us to share, post and do the work. How does an accountability circle work? We manage to accomplish the “must-do’s”—getting to work, taxes paid, gas in the car, and food to eat. But it’s easy to postpone goals that are important but not urgent. We tend to put off “someday” goals until the kids are launched, bills are paid, or life settles down. Often with goals, the hardest step is the first one. Your initial goal may even require compiling a list of things you’d like to be, do or have. A SEA circle is a buddy system that helps each member take baby steps in the direction of dreams. The format is similar to the weekly check-in’s of Weight Watchers–each person chooses her goals, which can range from making a call she’s been avoiding to strategizing a job search or writing a book. 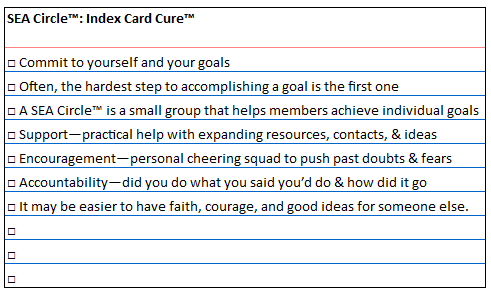 Developing Index Card Cure™ was one of my goals and SEA Circle™ has helped get it off the drawing board. Support—Provides practical help with expanding resources, contacts, ideas, and skills. Accountability—someone is waiting to hear whether you did what you said you’d do and how it went. Alone, you can find excuses for delaying. With someone to answer to, it’s harder to justify procrastinating. How it works. The process is simple—develop your goals then report on them. When we met in person, each person would speak twice—first reviewing past goals then publishing new goals. We also wrote down each other’s goals. That way, we can look for resources/contacts for each other and it removes excuses, like “I lost my list”. SEA Circle™ is a way we honor ourselves and our goals. It’s easier to have faith, courage, and good ideas for someone else. Lose your money and you can probably earn it back. Squander your time and it’s gone forever. One life, no rough draft.